Richard Judge has been appointed as the interim Chief Executive of the Rural Payments Agency. Richard Judge has been appointed as the interim Chief Executive of the Rural Payments Agency, Agriculture Minister Jim Paice announced today. 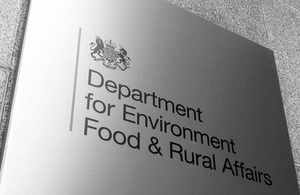 Dr Judge, who is currently Chief Executive of the Centre for Environment, Fisheries and Aquaculture Science (Cefas), will formally take up the interim role from Monday 2 August for a period of three to six months, while a permanent Chief Executive is recruited. As well as extensive leadership experience in Chief Executive roles, Dr Judge is very familiar with how Defra works and of current pressures such as the Spending Review. A Chartered Engineer by background, his career has spanned both the private and the public sector. “Over the next few months, we will be seeking a new, permanent, Chief Executive for the Rural Payments Agency from the widest available pool. But in the meantime, the organisation needs strong leadership as we start to implement the priorities I set out in our response to the RPA Review. “I welcome Richard Judge to the job, and I’m looking forward to sitting down with him and the rest of RPA’s oversight board in early August for my first meeting as Chair of the board. Tony Cooper, the outgoing Chief Executive of the Rural Payments Agency, announced his retirement earlier this month. Richard Judge joined Cefas in February 2007, following a career in industry that spanned the nuclear, rail and environmental sectors in the UK and internationally. He previously worked as Divisional MD and at board level in market-leading businesses delivering high-value science and technology-based services to the public and private sectors. He has particular experience in leading transformational change, and a track record of engaging highly skilled teams and individuals to deliver step changes in performance through strategies founded on customer focus, improved operational effectiveness and innovation. Richard is a Chartered Engineer and a Fellow of the Institution of Mechanical Engineers.